The Green Bay Packers visit the Detroit Lions in Week 17 of the 2017 NFL season. PFF previews the top player matchups of the game. 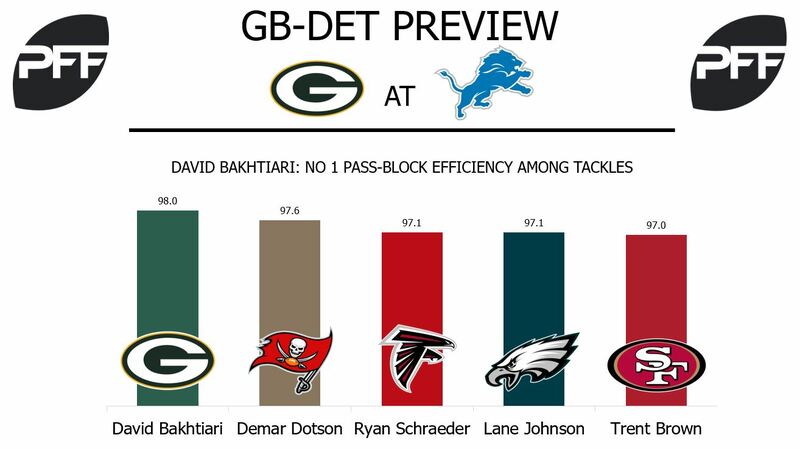 T David Bakhtiari vs. Edge Ezekiel Ansah – Bakhtiari’s overall grade of 89.2 is the best among offensive tackles. He’s allowed only 11 total pressures and has a pass-blocking efficiency of 98.0. He’s one of five tackles that have played at least 316 pass-block snaps and allowed no more than one sack. Ansah has a 10.7 pass-rush productivity when rushing from the right side of the defense. His pass-rush grade of 76.5 is tied for 44th among edge defenders. Ansah will have his work cut out for him if he wants to make a pass-rushing impact in this one. RB Jamaal Williams vs. LB Tahir Whitehead – Williams approaches Week 17 tied for 41st among running backs with an overall grade of 71.0. He has an elusive rating of 29.5 and is averaging 2.37 yards after contact per rushing attempt. The Lions will hope that Tahir Whithead is up to the challenge of slowing Williams down. Whitehead ranks eighth among linebackers with 33 run stops. His run-defense grade of 86.5 is 12th. WR Randall Cobb vs. S Quandre Diggs – Cobb has been the main target out of the slot for the Packers. He’s caught 41 of 57 passes for 443 yards and three touchdowns out of the slot. He possesses a wide receiver rating of 100.4, which ranks 28th for his position. Additionally, he averages 6.5 yards after the catch, which is tied for ninth among receivers. Diggs has allowed 23 catches for 312 yards and three touchdowns in slot coverage. Quarterbacks throwing against him in slot coverage average a passer rating of 122.6. TE Eric Ebron vs. Packers defense – While both the Lions and Packers wont being playing for much in terms of playoff hopes this coming week, each player will still be looking to leave their best impression as the season ends. Eric Ebron has an opportunity to put an exclamation point on what has been his best season as a pro. After a few shaky moments to start the season, Ebron has settled in nicely and has been one of the top-graded tight ends league-wide over the past seven games. Flashing ability as a receiver, Ebron has worked his way into a top-10 receiving grade on the season with a mark of 75.9. This week he matches up with a Packers defense that has struggled against opposing teams top tight end threat. Just two weeks ago they allowed nine receptions on 11 targets for 116 yards and a touchdown to Greg Olsen. If Ebron can find similar production, he will play a crucial part in the game’s outcome. 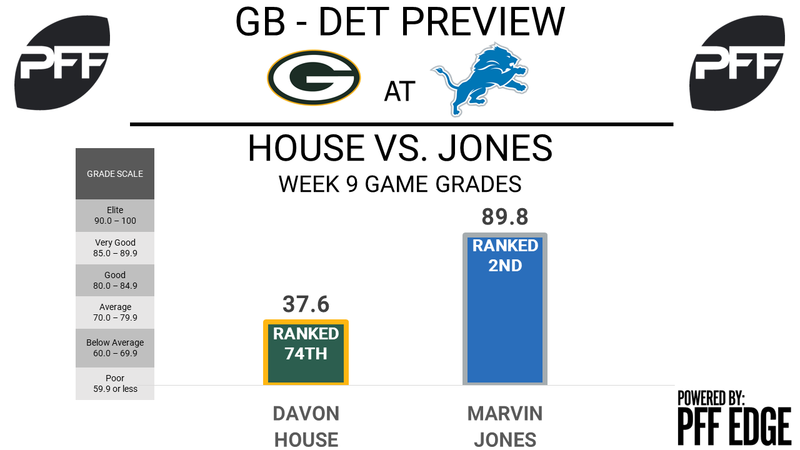 WR Marvin Jones vs. CB Davon House – Back in Week 9 Jones lit the Packers secondary up, catching seven of 11 targets for 107 yards and two touchdowns. House was responsible for allowing four of those catches for 57 yards and a touchdown, which was one of Jones’ five deep receiving touchdowns this season. House has played just below average all year and ranks 86th among cornerbacks with an overall grade of 69.7. Quarterbacks have been productive when targeting him, producing a passer rating of 103.0. The Lions could like to find similar success targeting the matchup this week in hopes of ending the season with a winning record. QB Matthew Stafford vs. Packers pass-rush – Stafford had arguably his best game of the season back in Week 9 when these two teams matched up last, as his 88.1 game grade was the top game grade among quarterbacks that week. Stafford was kept clean on 25 of his dropbacks and did serious damage, completing 23-of-25 passes for 315 yards and two touchdowns. If the Packers want a shot at stopping the Stafford and the Lions passing attack, getting a pass-rush will be crucial. Since their Week 9 game the Packers rank 26th as a defense with a pressure rate of just 32.9 percent while the Lions offensive line ranks 19th in pressure rate allowed with a mark of 34.6 percent.